You would have thought we’d never seen a helicopter before. From our offices across the Eisenhower, we watched it fly in circles over our campus, some of us with cameras out. From west to east, then north somewhere behind our building and out again. I bumped my head on the window a few times. 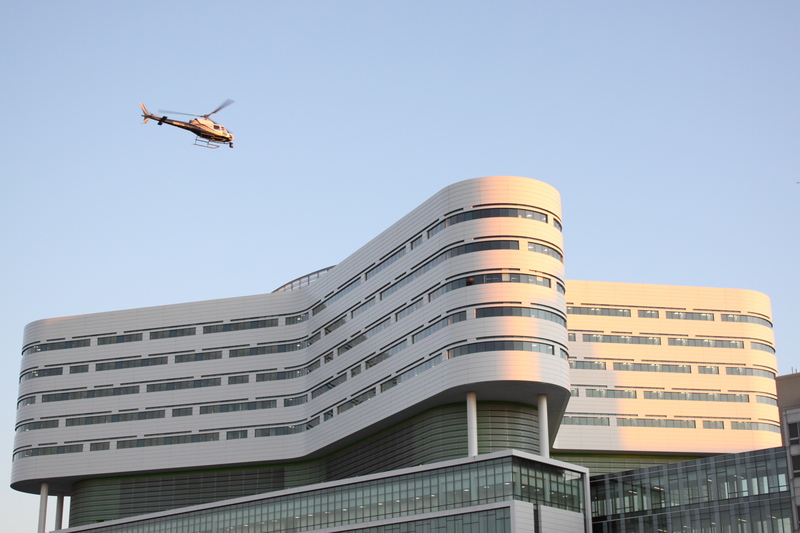 Yesterday’s excitement seems silly today — taking pictures of a chopper that’s taking pictures of our new hospital. The chopper did the real photography. And there’s the irony. For years we’ve chanted “It’s not about the building,” our mantra for the communication we would conduct once the hospital was built. Then, for that very purpose, I’d directed a camera to point at it from every possible external angle. As it turns out, the quickest route to our most important message is by way of the building’s architecture. More about that later. It’s time to get to work for the next shoot. The sun is not up, but it’s time. This entry was posted in New Hospital Building, Rush Transformation and tagged new rush hospital, photography, Rush Transformation. Bookmark the permalink. So cool! It was exciting to see the chopper buzzing around all day long!